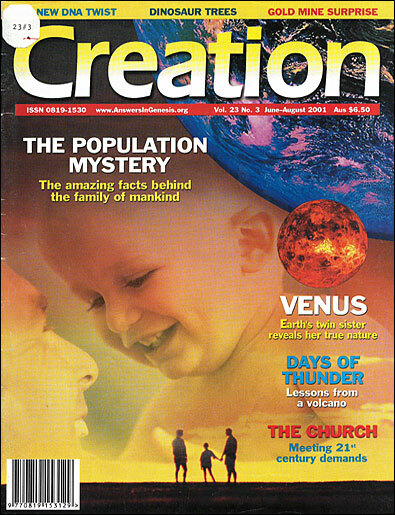 Please note:The "Answers For Kids" section in Creation magazine is a full-color section full of cartoons, images, and other graphical information. We are only able to reproduce the main text for the Web site. God is infinite—He has no beginning (He was never born) and He has no end (He can never die). He is the eternal Creator of all things—space, matter, and even time itself. Unlike the 'Energizer Bunny', which just keeps going and going on its own power (or so the ad would have you believe), the universe is running out of available energy and is becoming more chaotic, or disorderly, as time goes on. Eventually, there will be no more energy available throughout the universe to accomplish any work. So where did all the original available energy come from, i.e. how was it 'wound up' initially? Someone outside of the universe had to have created it orderly in the beginning—that Someone was God. Our bodies are made up of trillions of cells. Just one of those cells contains enough information about our bodies to fill 500,000 close-typed pages! Scientists who study DNA (or deoxyribonucleic acid—a special large molecule that stores all that information in our cells) have not observed huge amounts—or any amount, in fact—of new information originating by chance. The information stored in our DNA is only rearranged or decreased as it is passed from parent to child. So where did the information in all living things come from in the first place? Current scientific observations show that information can only come from a source of intelligence, ultimately. Since God is infinitely intelligent, it makes sense that He is the author of all the information. Those who believe that molecules have evolved into man (even though modern science has shown it just isn't possible) must also believe that the universe is billions of years old. Yet there is much evidence that is consistent with the Bible's teaching that the universe has not been around for billions of years, but was created by God around 6,000 years ago. Many tribes and nations share stories or legends similar to the original, unchanged accounts of Creation, Noah's Flood and the break-up of the people at Babel, all found in the Bible. Why is this so? The Bible explains it! As Noah's descendants spread around the Earth after the Flood, they took the knowledge of Creation and the Flood with them, but the stories have gradually changed over the years with continual retelling. Also, scientists are finding that there is no significant difference between the various so-called 'races' of people. This is consistent with the Bible's teaching that there is only one 'race'—all humans are descendants of Adam. The Bible says those who deny God are without excuse, since the creation makes it plain that there is an all-powerful God, as shown by the above examples (Romans 1:20).